Charlie Haeger struggled with his control in the loss, walking seven while allowing five runs on six hits in 4 1/3. Chris Carpenter followed with 1 2/3 innings of hitless relief, and Brock Huntzinger gave up an unearned run in two innings. A trio of ex-PawSox played key roles for Norfolk. Luis Exposito went 2 for 4, including a two-run homer off of Haeger, Yamaico Navarro had a two-run double, and Manny Delcarmen retired the only two batters he faced to quell an eighth-inning rally. A matchup of highly regarded pitching prospects lived up to its hype. Unfortunately for the SeaDogs, A.J. Cole out-dueled Matt Barnes, as the Sea Dogs fell 2-1 to the Harrisburg Senators (WAS). It was another strong start for Barnes, who allowed a run on just two hits in five innings, walking three and striking out eight. The only negative to take away from his performance was inefficiency - the righty was taken out after five after already reaching 92 pitches. The Sea Dogs managed only five hits off of Senator pitching. Unsurprisingly, two of those came off the bat of third baseman Garin Cecchini, who has hit in seven straight. Cole's shutout bid was thwarted when Travis Shaw smashed his 12th home run of the year to right field. Defensive miscues doomed Salem in a 5-3 loss to the Frederick Keys (BAL). The Red Sox committed five errors, each of which led directly to four of Frederick's five runs. Only one of the four runs allowed by Heri Quevedo in his six innings of work ended up being earned, as the right-hander had his third straight solid start. Obscured in the fielding misadventures were some solid offensive performances as part of a 10-hit Salem attack. In his second game since being promoted, David Chester knocked his first two base hits. Keury De La Cruz went 2 for 4 with a double, and Blake Swihart added a 2 for 4 night of his own. Greenville fell behind early, but some defensive wizardry and clutch hitting led the Drive to a 5-4 victory in 12 innings over the Lakewood BlueClaws (PHI). Down 4-3 in the seventh, Lakewood was threatening with men at first and second. Chace Numata then hit a liner that was snared by Raynel Velette, who then turned and threw to Jose Vinicio. Vinicio then touched second and quickly tagged the runner on the move from first, completing the extremely rare 1-6 double play. According to milb.com, it marked the first triple play in Greenville franchise history, dating back to 1977. After turning three, Greenville pitching went into lockdown mode, retiring the next 15 batters they faced. Gerardo Oliveras tossed three hitless innings, striking out two. He was followed by Austin Maddox, who also struck out two as part of two perfect innings, earning the win. Before the triple play, a three-run homer by Tim Roberson got the Drive back into the contest. Roberson played a key role again as part of an eighth-inning, game-tying rally. The designated hitter walked, advanced to second on a wild pitch, moved up to third on a ground out, and came in to score on an Aneury Tavarez sacrifice fly. In the 12th inning, Reed Gragnani led off with a walk and moved up to second on a bunt base hit by Vinicio. Roberson came to the plate again in a vital situation, but this time bounced into a 5-4-3 double play. Mario Martinez picked him up, however, ripping a line drive to right field for his fifth hit of the game to plate Gragnani with what proved to be the winning run. Vinicio had two hits on the night, scoring a run on the Roberson homer. Lowell's game against the Brooklyn Cyclones was rained out and will not be made up. While those who showed up at LeLacheur Park did not get to see a ballgame, they did not come away empty handed, as fans still received their Jack Kerouac LHS Football bobbleheads and are also able to exchange their tickets for an upcoming game. The night after their seven-game winning streak was halted, the GCL Red Sox fell again to the GCL Rays by a score of 8-3. Willie Ethington got the start, allowing three runs (one earned) on five hits in four innings, while striking out seven and walking a pair. The seven strikeouts represent a professional high for Ethington, but it was also the first time in his career that he walked more than one. Zach Good struggled in relief, allowing five runs (four earned) in his only inning of work. Rob Smorol was able to stop the bleeding, pitching three shutout innings and allowing three hits. He did not issue a walk and struck out four. Jake Davies had two of the five Red Sox hits. Wendell Rijo went 0 for 4, ending his hitting streak at six games. However, his walk extends his on-base streak to 14. During that run, Rijo has a .408/.508/.592 batting line. 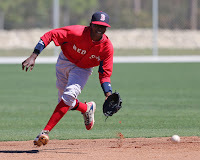 It was a marathon in the Dominican Summer League, with the Red Sox prevailing 7-5 over the DSL Astros in 19 innings. Yankory Pimentel had a strong start for the Sox, giving up a run on just two hits in six innings, and departing with a 2-1 lead. However, the Astros were able to tie the score in the eighth, and the game remained deadlocked until the 14th. Juan Hernandez was hit by a pitch to lead off the inning, and moved to second when Ricardo Andujar reached on an error. A Darwin Pena single loaded the bases, and brought the go-ahead run 90 feet away. After a pop out, Jhon Nunez ripped a base hit up the middlle, scoring Hernandez and Andujar. Pena then came home on a grounder by Isaias Lucena that forced Nunez at second, giving the Red Sox a 5-2 lead. The Astros then staged a stunning comeback in the bottom of the inning. Algenis Martinez retired the first two batters, but a walk, a single, and a two-run triple knocked the lead down to one. Victor Ramirez replaced Martinez on the mound, but allowed a game-tying single to the first batter he faced, and the teams played on. After four more scoreless frames, and fatigue setting in, the Red Sox were able to take advantage of a pair of miscues in the 19th. Franklin Guzman led off with a base hit and moved to second on a throwing error. Nunez attempted to bunt him over to third, but another errant throw scored Guzman with the go-ahead run, advancing Nunez to second. Lucena then sacrificed Nunez to third. Javier Guerra squeezed home Nunez with yet another bunt, giving the Red Sox a 7-5 lead. This time, Samir El Halaby would slam the door, earning his fourth win. Player of the Day: It was an eventful day for Jose Vinicio. Beyond turning the first triple play in Greenville Drive history, the shortstop had two hits, scored a run, and played a key role in the team's 12th-inning, game-winning rally.